It is not easy to explain why St. John's Chapel is one of the most enjoyable climbs in Cambridge. It is almost as high as King's, but is aesthetically more philistine. Rising from a cluster of buildings, it is basically a large square tower, with four corner pinnacles. The whole effect is singularly unattractive. But it would be wrong to judge the climb by analysing the architectural form of the building. The beauty of the chapel lies essentially in its climbing. It is a climber's building and a climber's climb. We set out to see it one night and it was to haunt us for many months. I had a friend in John's, and Dave and I went round to see him one night. We brought a small rucksack with ropes, camera, etc., intending to attempt it, if all was well. My friend, Alan, decided to come out with us. 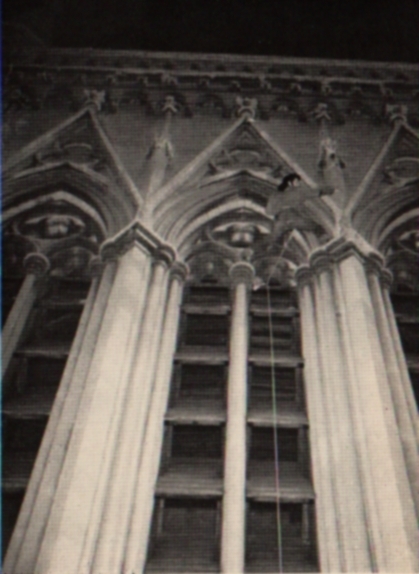 At the time there was scaffolding in Second Court, and we used this to get up onto the roof of the Hall, as Alan was no night-climber. Unfortunately, it was a hectic night in the college, with people dashing around everywhere. Alan spotted a porter and one or two fellows, so we lay low for a while. Then we continued up a loose-tiled roof, but decided not to go on as Alan was in no condition. It was a frustrating night in many ways, but Dave and I managed to get a look at the tower. We were very impressed. But it was several months until we got round to trying it again. Eventually, we decided to climb the chapel. Brian was unwell on the night and I had hurt my chest a few days previously. Our party was understrength, but we decided to go ahead as planned. Dave would climb first on a top-rope, I would follow, and then Nick. We climbed into St. John's by an unusual way. Taking a drainpipe by one of the buttresses, the three of us were soon up on the roof of the chapel below the tower. This drainpipe route is quite easy, though it is moderately long and can be awkward in places. So far all was well. We decided that, since it was questionable whether my chest would hold out, it would be best if I went up the stairs on the inside of the tower. Nick came with me. Dave had to walk round the lower roof to get to the north side of the tower (facing Bridge Street). Nick and I, meanwhile, walked up those almost unending stairs. Finally, we were in position on top of the chapel. Nick decided to belay Dave. Unfortunately, there then occurred a complete misunderstanding (the sort that is often dreamt of, but rarely committed) which delayed us for well over an hour. Dave was preparing to climb up the west side of the northern ridge, but Nick and I understood that he was coming up the east side. The agony that followed from this is unspeakable. Nick lowered the rope down to the east side, but Dave was unable to see it as it was practically the same colour as the chapel stonework. And our apparently superb viewing position was useless as we could not see Dave in the shadows. Dave obviously did not realise this, and so, thinking that we were in difficulties with the equipment, kept quiet and concealed himself further in the darkness. After a while we began to get anxious, and Nick went down to see what was going on. It took him a long time to go down and get round to the Bridge Street side and poor Dave was on the point of giving up for the night. The next episode, rather comical in hindsight, was for us quite dramatic at the time. After a considerable wait without seeing a sign of anybody, I decided to go down and investigate. As I was coming down, Dave and Nick met up with each other and sorted out the confusion. Then Nick sped off to give Dave a top-rope, I came down a different way to Nick and so missed him on my way to the north face. When I arrived, Dave told me what had happened, and I went up again to help Nick. Looking over the edge of the tower, I could see nothing until Dave did the step out from beneath the overhang at the top of the windows. Then I had a fantastic view of the last pitch. Dave was overjoyed when he got to the top, and we all did a war-dance as a sort of celebration. Unfortunately, we had been delayed so much that it was now quite light, and we were forced to return to college before either Nick or I could attempt the climb. Still, it was a fantastic night, and it taught us a lesson to be more accurate in the future. The next time we climbed the chapel, the four of us were together for the first time for several months. Various things had made it impossible for one or other of us to come out in the weeks previous. We went to the Volunteer to celebrate the occasion and then to the New Bengal. The curry was very hot that night, Brian's especially, but it helped to keep the cold off our backs. It was just gone one o'clock when we climbed into St. John's. We were soon on the roof of the chapel, gazing up at the tower before us. Dave, who was the only one of us to have climbed it before, was to lead. He roped up and Nick belayed him. Dave moved steadily up and soon it was difficult to pick him out against the stonework. Meanwhile, Brian had collapsed with acute stomach pains (not the result of the curry, I hasten to add) and had to be counted out of the climb that night. When Dave reached the top, he tied himself into a good position on the inside of the parapet and tugged on the rope three times. Nick tied on and began climbing. Unfortunately, Nick was wearing ordinary shoes — his others were being repaired — which slipped a great deal. Consequently, he came unstuck on the first short drainpipe at the top of the ridge, as his feet could get no grip on the stonework. He soon became exhausted and was forced to retreat. Fortunately, Dave had worked out that something had gone wrong and had paid out the rope. I tied on and began climbing. The climb shown in the following photographs is started from the top of the sloping roof in the centre of the picture. Drainpipe below the louvred windows. The step-out from the clover-leaf. Pulling up on ornaments below the parapet. The step-out and following move taken from one of the statues on the corner beside the windows. The roof is steep and long, but there is an excellent stone lay-back hold for the left hand. The right hand can either rest on the near horizontal drainpipe or be used to layback. Near the top I found a few loose tiles, but they did not bother me much. though one piece slid down the roof at great speed, missed Nick's head by inches. and shattered in the court below with an almighty crash. Soon I was sitting astride the ridge feeling beautifully exposed. The tower proper was now before me. A short drainpipe ends below the first overhang. Dave had tied his first runner around the drainpipe. The pipe is short and easy, as it is square and away from the wall. I managed to hold on to it quite easily with one hand, and take the runner off with the other. This was placed around my neck. Then comes the first tricky manoeuvre — the mantelshelf. To get over the overhang, it is best to mantelshelf on the serrated edge of the drainpipe bowl (for one cannot get one's hands inside), then work one leg over the bowl and gradually transfer one hand, then the other, onto the ledge above. Then it is a straightforward pull-up. I was quite pleased to be standing at the base of the windows. The next pitch consists of chimneying up the louvred windows. 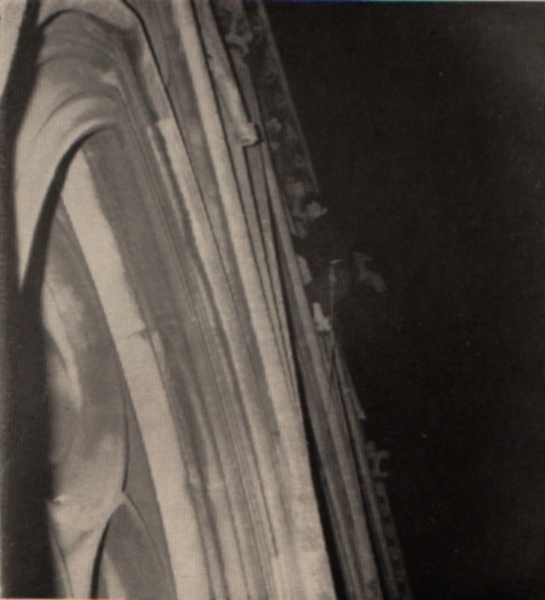 The technique is to put one's back against the central pillar of the window, and the feet on the outside pillar, excellent undergrips being provided by the undersides of the wooden slats. I found that the chimney was a comfortable width, and the view could be enjoyed on the way up. Near the top of the windows there is a rusty iron bar, around which Dave had put his second runner. Here I experienced some embarrassing difficulty. I was unable to take off the runner for ages. Being in the chimney position beneath the overhang, I was in the dark and was unable to see that Dave had used the screw carabiner. I was pushing at the gate for ages before I realised that he had used the one odd “crab” that we possessed. Having taken off the runner, I then moved over into the “clover leaf”, a little seat at the top of the windows. The view from here was magnificent, and I gazed around me for several minutes before continuing. The move out from beneath the overhang is quite easy, for there are adequate sidegrips and a good ledge to step onto. Then climb straight up the pillar. The first move is a little awkward, but then one can get a good handgrip on some ornaments on the pillar. The central pillar is square-shaped with one edge to the wall, so that it provides excellent handholds. The feet rest either side of slanting ledges. One then bridges up in this position, with one's feet getting further and further apart, until an ornament is reached. The feet can then be brought into the main pillar, where small ornaments provide a resting place. As I got to this resting place, Dave called in a whispered voice, “Mike, there's a car”. I had been so preoccupied with the climb that I did not notice someone drive into the court below us. I turned and saw the driver get out and look up at us. It was not long before I climbed the last part. Mantelshelf from the resting position, gripping the pillar with the knees, and reach for one of the small ornaments below the overhang, which provides an excellent sidegrip. Then, stand on the big ornament (the “cabbage”), which one has mantelshelved on, lean right out, reach over the top and pull up over the final overhang. It was a tremendous climb and I had not really noticed the exposure at all. It was beginning to get light, so we came straight down, and climbed out without incident. It was a brilliant night, especially for Dave and myself, though Nick and Brian were soon to have better luck. I mentioned that, when Dave told me of the car below me, I was unaware of any noise. This might seem strange to some people, so I will explain. If one is climbing correctly, then it is quite common to become so much engrossed in the climb that one is unaware of anything else. This may be illustrated by a tale concerning one proctor, two bulldogs and six humans. The six of us were Dave and myself, Enid (Dave's girlfriend) and three other friends of ours. 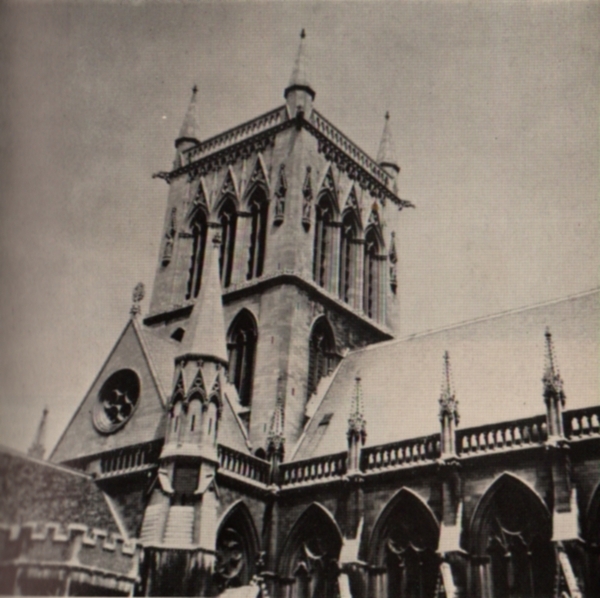 We were assembled in Jesus Lane, the purpose being to gain access to a college after the permitted hour of eleven o'clock. The plan was quite simple. I was to climb up onto a sign some distance up a lamp post. Dave was then to pass Enid up to me. I would then deposit her on top of the college wall after which all would be easy. I stood precariously balanced on top of the sign, and bent over ready to haul Enid up. Dave lifted her from beneath, and I grasped her wrists and took the strain. She was half-way up when one of the others announced: “It's a proctor.” By this time we were too engrossed to listen to him. Enid was now level with my chest, when a voice rang out: “It really is a proctor”. Enid relaxed her grip, I relaxed mine and almost lost my balance, and in a flash she was falling to the pavement below. There was a loud “thud” signifying to all that she had landed safely. Dave picked her up and rushed off with the others to the waiting van. The proctor and his bulldogs were somewhat bemused, it was not an unusual sight to see an undergraduate climb into his college, but to see six people of assorted sexes lined up beneath what must have seemed a most ungentlemanly entrance was enough to have startled even the most worldly proctor. He stood and gazed, sandwiched between two petrified bulldogs. I was the first to move, many seconds later, unceremoniously leaping from the sign to the college wall, into college and then out by another route. The story does not end here. Coming out of college again, I met up with the others who rebuked me for letting Enid fall. “Nonsense,” I retorted, “how the...”, when I realised that they had either got the message, or were only joking anyway. Dave then quietened us by saying that he thought one of the bulldogs was from our college, and that he could easily have recognised us. This meant that Dave and I had to go into college by the from gate so that the porter would see us (the gates were locked, and when the porter opened them for someone, it was customary for them to take his name), and this would throw suspicion away from us. We went in the front gate, the Porter duly took our names, and we immediately climbed out the back way. Now on with the story of the chapel. Planning photographs of climbing positions on the chapel provided us with many exciting hours. 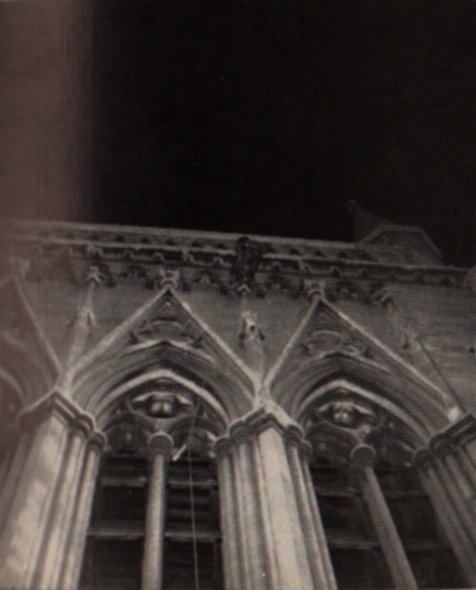 Once we used a telescope, set up in Dave's room, to analyse the condition of the stonework. On this occasion all our theorising finally emerged as a concrete coordinated plan, and the actual photographic climb proved, among other things, to be one of the most epic nights we had ever experienced. 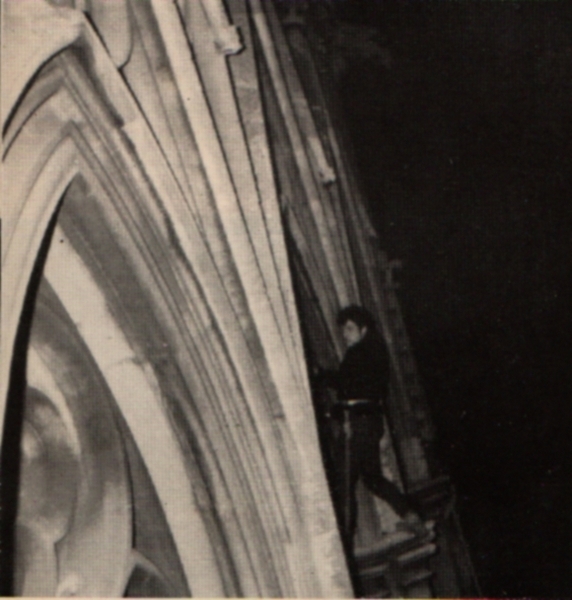 At about 1.30 a.m. Dave, Nick, Brian and I climbed into St. John's. We were soon up the short drainpipe in Chapel Court, and then distributed the load of equipment to take up the next drainpipe. Up to the base of the tower, everything went as planned. Then Dave and I left the other two and walked around the Chapel, up the stairs (always the hardest part) and then began sorting out everything at the top. 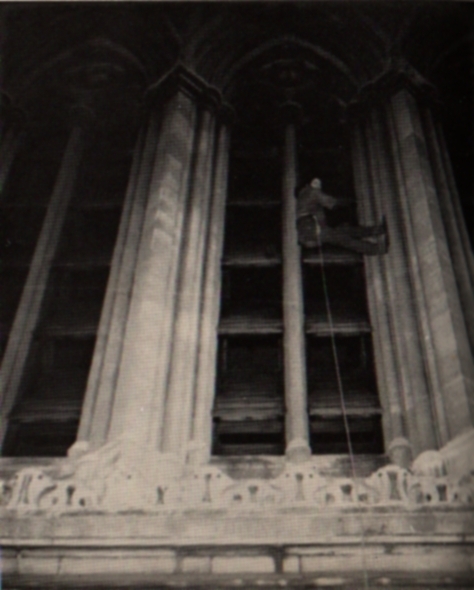 We were to use two ropes: one to hang down from the parapet at the top of the Chapel, on which I was to hang; the other was to be used by the leader (Dave). When my rope had been fixed in position, Dave abseiled down it, leaving me at the top with the photographic equipment. The plan was for me to hang from the rope and photograph along the face of the building. 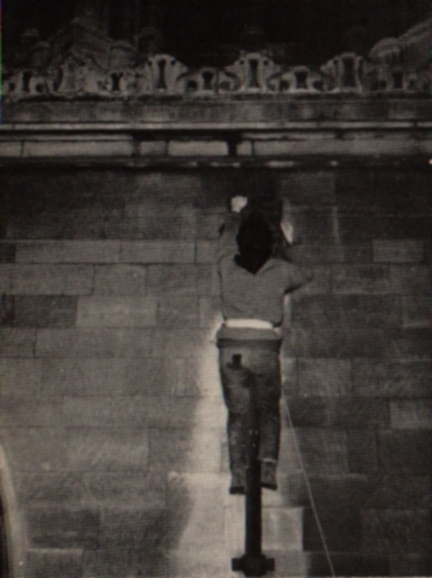 The rope was fixed to the Bridge Street face of the Chapel (i.e. the north end). To enable me to achieve this, I was clipped onto the rope by a descendeur, and also by a length of rope tied to the fixed rope with a “prussik” loop. A prussik loop was used because, the knot can be easily moved down a fixed rope by hand, but as soon as downward pressure is exerted on it, it “locks”. This meant that I could slide down the fixed rope on a descendeur, with the prussik knot in one hand, and as soon as I wished to stop, I would merely release my grip and allow the length of rope to become tight. I would then be anchored in the chosen position. Such was the theory. My other equipment comprised klets, jeans, anorak, a camera, flash bulbs and a pocket torch. In addition I had various slings and “crabs” around my neck, and a rope tied several times around my waist (to which the descendeur and prussik loop were tied) to distribute the strain. So, over the edge I went. I reached a good position after about ten feet and carried out the anchoring procedure. Unfortunately, two things went immediately wrong. First, when I pushed away from the wall with my feet, or turned to face Dave, I could not stop my body from spinning around. Thus it was impossible for me to hold the camera steady for a long enough period to take photographs. Second and worse, the prussik rope was far too long. For by the time that my body had taken the strain, the knot was about 5 feet above my head and well out of reach. To move from that position would involve climbing up the rope by hand, releasing the prussik loop and sliding back down. The prospect did not please me. Dave now came into my sight, climbing very quickly and enjoying every minute of the climb. He soon stopped when he noticed my ridiculous position. After a brief discussion we decided that I should come down a few feet and then swing out to my left onto a statue. The ropes around my waist were now cutting into my skin. So, I went up the rope, hand over hand, and released the prussik knot, but in doing so the descendeur became untied. I was now in a ridiculous position, and was forced to hang onto the rope with one hand, re-secure the descendeur with the other, and then move slowly down to exactly the right position. I did not want to repeat that performance. Climbing is not a series of acrobatics. I was pretty tired now, and spent another few exhausting minutes swinging towards the statue. Eventually I managed to lassoo its head (sacrilege), and make myself secure, standing on its base. I prayed that it was well-constructed and that it would not suddenly come away in my arms. Now I could lean out at an angle and look along the face towards Dave. I took several photographs, changing bulbs by the light of the pocket torch, held between my teeth. During all this time Dave was tremendous. He had climbed up to the step-out position at the top of the window and patiently waited for me to get into position. Then after what must have seemed an interminable time, he completed the climb brilliantly, posing in awkward and exposed places. Nick followed Dave, and I went down to a lower position on the fixed rope, to get some different shots. Unfortunately, the louvred windows reflected the light back into the camera, and the photographs were ruined. By this time I was so exhausted, that I untied the prussik loop and went down on the descendeur at great speed — it was almost too hot to touch at the bottom. I was now in no position to climb. My hands were blistered, my arms exhausted, and my waist cut and rope-burned. I was not feeling too brilliant. And poor Brian had no opportunity to climb for it was now 5 o'clock. Still we were all agreed: it was a tremendous evening. We had learned many lessens, and the only pity was that we had to undergo this ordeal to increase our store of experience. But that, of course, is half the fun.